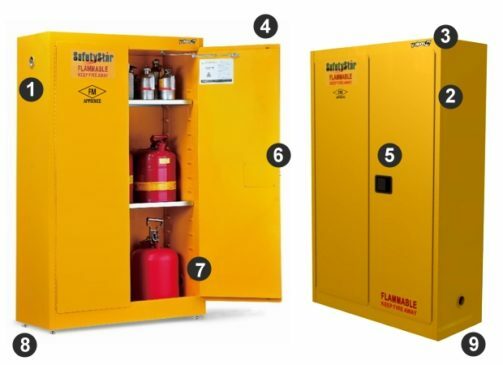 All SafetyStar® series Flammables Safety Cabinets are FM Approved and comply with NFPA and OSHA regulations. FM Approval is a symbol of quality excellence, a guarantee over fire prevention, work safety and environmental protection. 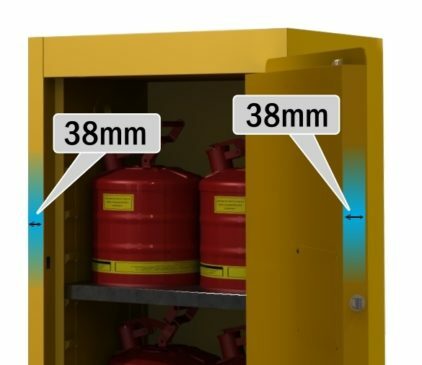 Double-wall cabinet construction with heavy-duty steel and 38mm air space efficiently isolates from combustion. Both manual and self-closing doors can be fully opened to 180°. Easy operation. Three cabinet styles:single -door cabinets, double-door cabinets and sliding-door cabinets. To prevent exterior flame to enter the cabinet body and to prevent flame flees out from the safety cabinet. Dual vents with flame arrester placed on both sides of the cabinets. 1.2mm steel continuous piano hinge provides smooth closure, reliable and durable use. Rounded corners avoid potential hand injury. Non-sparking, 3-point linked latching device provides better security. Eliminates projecting obstacles. Easy open and close. 2 inch deep leak-tight containment sump for accidental drips and spills. 4 full steel adjustable levelers installed in base for stability. Able to guide static electricity to the ground, avoiding explosion caused by sparks.